The mission of the Kansas EMS Association is to be a single voice for EMS professionals, ambulance services and other interested entities, and to further the continued improvement of emergency medical services throughout Kansas. Lots of upcoming events and registration is open for many of them! See the list below. KEMSA is busy planning events for 2019 that will be valuable to our members. Mark your calendars for the dates below, watch for other events (including a Just Culture Workshop, spring billing workshop and 4-day management workshop), and check our website for complete details as they are available. We hope to see you at some of our events next year as we provide training and advocate for EMS in Kansas. April 17-18, April 25-26 - Kansas EMS Four-Day Management Workshop, Manhattan, KS - Details here. WORKSHOP IS FULL. May 10 - A Day in Our Lives Workshop - Wichita, KS - REGISTER HERE by May 3. May 17 – KEMSA Golf Tournament, Newton, KS - REGISTER HERE by May 3. HOTEL RESERVATIONS - Reserve your hotel room now as they sell out every year! More events will be added to this list soon! Watch for details. 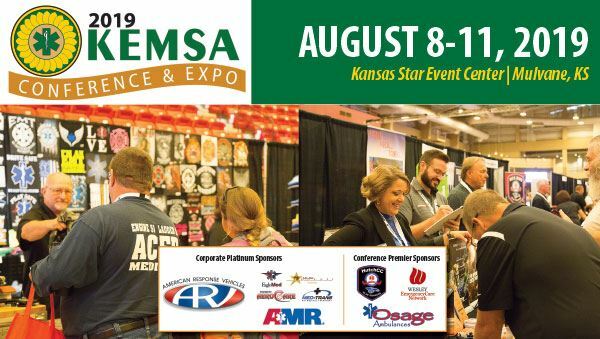 Registration for the 2019 KEMSA Conference & Expo is now open. Click on the register now button below for complete details, to download the brochure, and to register online. We hope to see you there! KEMSA is Looking for Exhibitors and Sponsors! You are invited to join us as an exhibitor and sponsor to help us continue to provide a high quality educational conference for emergency medical services personnel in the state and surrounding areas - from first responders to paramedics, as well as physicians, educators, firefighters, service directors, managers and more! We are planning for more than 450 attendees at our 2019 KEMSA Conference & Expo. KEMSA is a professional membership organization and does not regulate the EMS profession in Kansas. KEMSA is proud that we have members in all 6 regions in Kansas with members located in 90 of the 105 counties in Kansas and five other states. About 85% of the services in Kansas have a service membership with KEMSA. KEMSA has more than 100 active service memberships, which represents more than 5,000 certified EMS attendants working within Kansas EMS agencies, and more than 2,000 active individual memberships. Learn more about KEMSA here.  KEMSA Chronicle, and much more!  See all benefits here.